VRIES, Hugo de and Daniel Trembly MACDOUGAL (editor). Species and varieties. Their origin by mutation. Chicago, Open Court publishing company; London, Kegan Paul, Trench, Trübner and co., 1905. Large 8vo (22 x 14 cm). Later red cloth, with the original backstrip laid down. 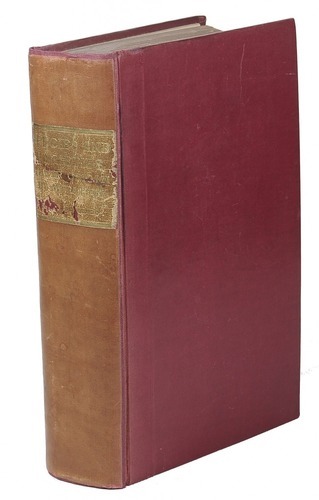 First edition of the collected lectures on mutation given by the Amsterdam professor in Botany Hugo de Vries (1848-1935), at the University of California during the summer of 1904, edited by Daniel Trembly MacDougal. "The purpose of the lectures is to point out the means and methods by which the origin of species and varieties may become an object for experimental inquiry, in the interest of agricultural and horticultural practice as well as in that of general biologic science" (preface). 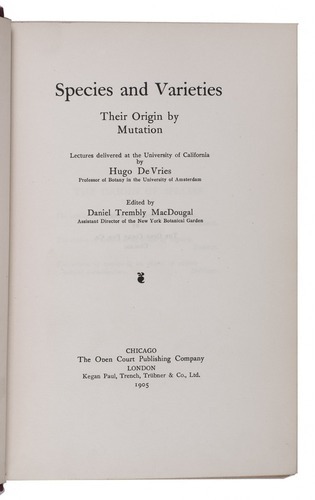 The lectures are based on De Vries's theory as described in his Die Mutationstheorie, assuming "that new species and varieties are produced from existing forms by sudden leaps" (preface), instead of the popular belief that species very slowly changed into new types.Title-label slightly damaged, otherwise in very good condition. BMC NH, p. 2240; Stafleu & Cowan 16383.